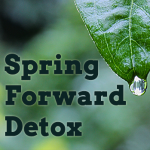 Our Spring Forward Detox is guaranteed to propel you to a higher level of health. We make great health simple, accessible, and delicious! This program features no radical fasting or “liquids only” dieting. We believe in sustainable change you want to live by, not crazy diets. Through the Spring Forward Detox you will find the foods that are right for you, so you can ditch the ones that aren’t! Heal digestive issues and identify food sensitivities. This program is perfect for any one suffering from chronic bloating and gassiness, bowel regularity issues, digestive pain, or acid reflux. Reduce stress and rev up your metabolism. Cleaning up your diet for 21 days will have a powerful impact on your emotional and mental state. As stress melts away, your metabolism will be able to function optimally. Private Online Forum to get all of your questions answered quickly! BONUS post-cleanse strategy session with a Health Coach to keep you on the right track! So, do you want to learn how to cook healthier for yourself and for your family? Do you want to shed a few pounds?Are you looking to feel more energized, clear, and confident? Is it time for you to put your health first? Then it is time to sign up today! What foods are going to be eliminated? During the detox we will be eliminating, or greatly limiting, our consumption of inflammatory foods. This includes gluten, corn, dairy, and processed foods. Yes, dairy. That means no cheese for 21 days. Trust me, it is way easier than it sounds! A couple of other biggies? No alcohol, and very limited intake of caffeine and sugar. During Phase 2 (which lasts for 7 days) we will also eliminate meat and nightshades. Wait, no meat? Where will I get my protein? If I had a dollar for every time my boyfriend asked this question, I would be a very wealthy woman. Take a minute to think about cows, elephants, and moose. Those are some seriously massive animals with some huge muscles– did you know a male moose can weigh up to 1,600 pounds? Those are also some seriously vegetarian animals. So, we will be getting our protein from the same source they do: plants. Trust me, if a moose can get enough protein from eating their veggies, so can you! Am I going to be hungry? Nope! Definitely not. There is no calorie restriction on this detox program. There will be plenty of delicious options for you to eat, and you should never feel hungry or unsatisfied. Do I need a juicer or a blender? Juicing is not a major component of this program, so you do not need a juicer. If you have one, that is great! I’ll be including a few of my favorite juicing recipes for you to try out. You will, however, need a blender. It doesn’t need to be a fancy one, any old blender will do. Green smoothies are about to become your best friend.